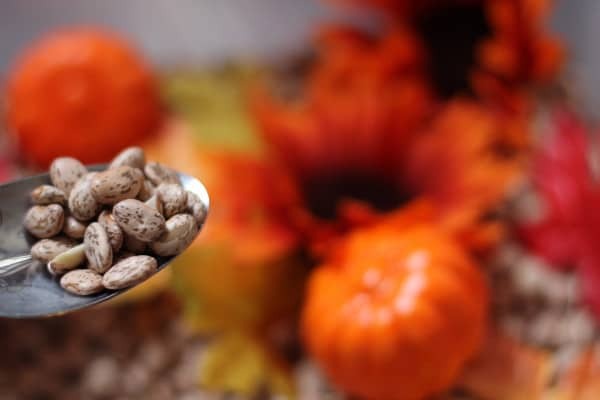 While I adore the overdose of pumpkin lattes and fuzzy sweaters there is another reason that I really love fall. 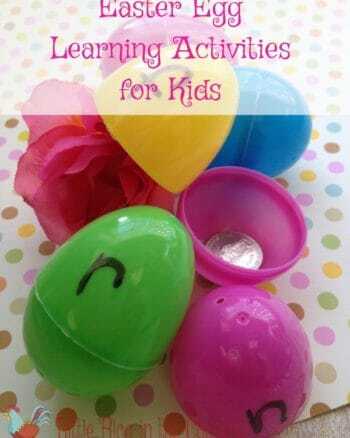 It lends itself so perfectly to fun activities for kids. 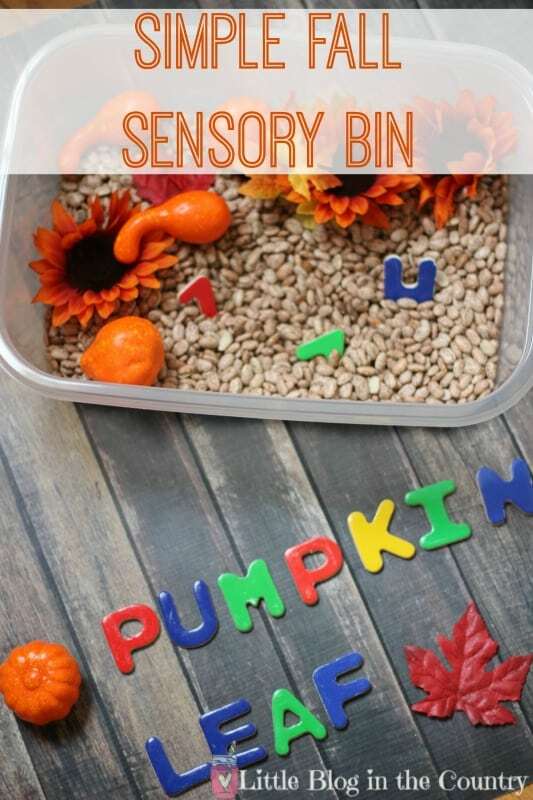 This Fall Sensory Bin is full of fun textures and learning opportunities for toddlers, preschoolers, and early elementary kids. 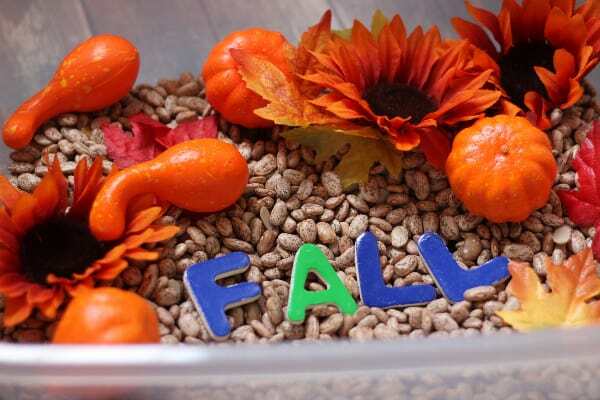 Grab a large bin, a few fall items, and a few learning items you probably already have on hand and see just how long the kids are captivated. 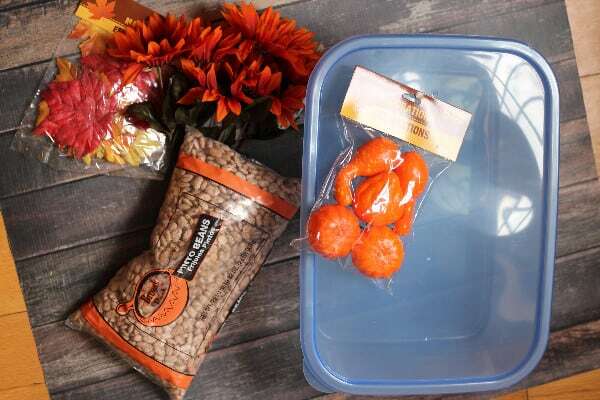 First, you will need a large plastic tub, about 18″ x 18″ is great size for one to two kids, some filler-beans are perfect and inexpensive, and assorted fall items-silk leaves, flowers, mini pumpkins, etc… I was able to grab everything at Dollar Tree including my tub for about $5 and it is all reusable. 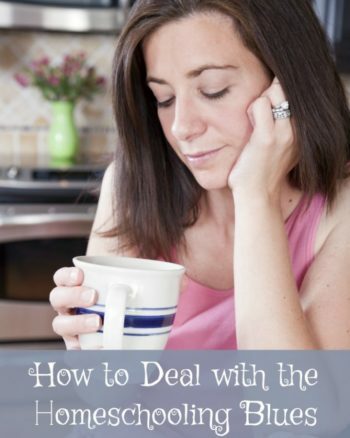 Next, pour in your beans. 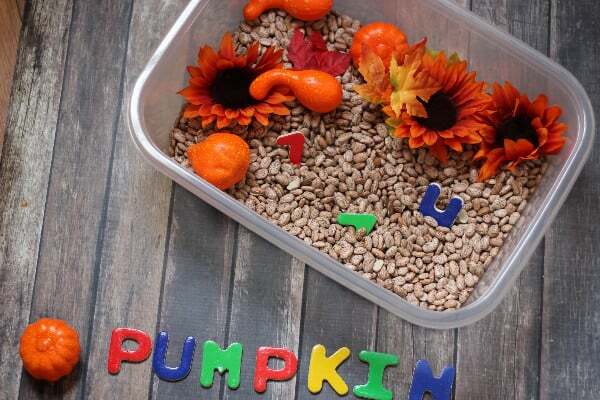 Add flowers, leaves, mini pumpkins and gourds to give you sensory bin a fall flair. Have your child search for and identify letters and their sounds. 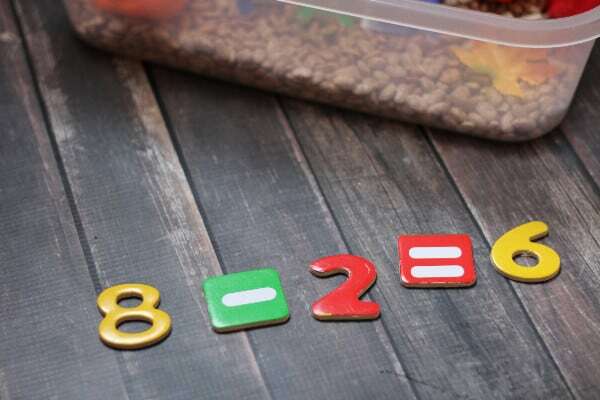 Let them draw numbers and operation symbols at random and have them solve the math problems, talk about the symbols and help your child as needed. Ask your child to find the letters and spell out simple sight words. Start a pattern and have your child continue it. 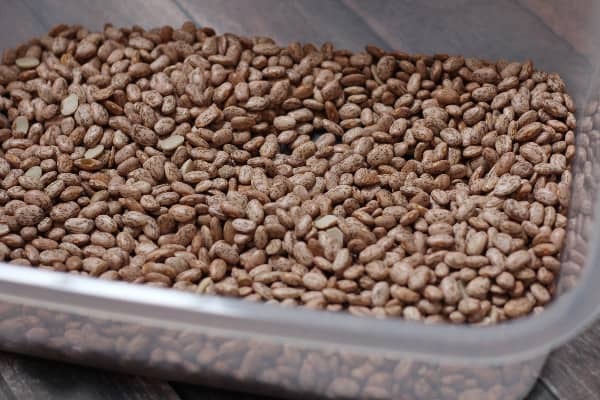 Even free play like practicing scooping, stirring, and grasping items is great for building your child's fine motor skills up. 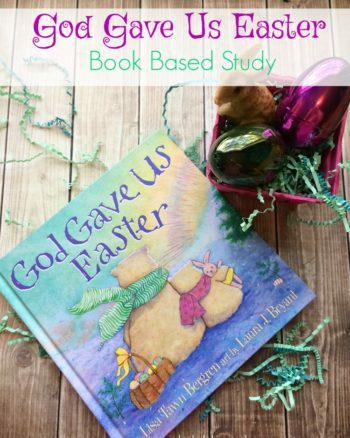 This is an important prewriting skill for them to learn and much of it is done through play. 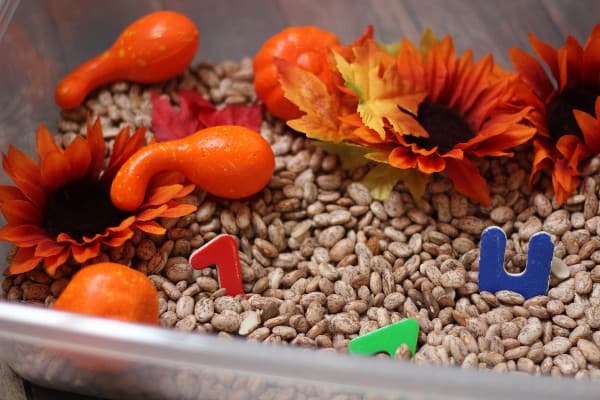 Create a fall sensory bin to surprise your child, it is a also a great way to keep them busy while you are trying to make dinner or have a phone call! 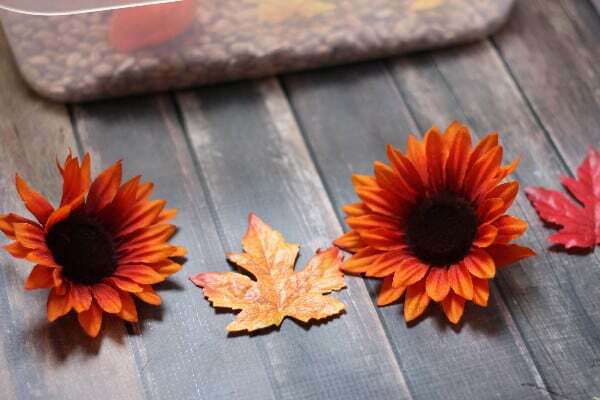 Check out more fall fun for your kids below!